As part of efforts to be a leading institution in helping college students from underserved communities succeed academically, Franklin & Marshall College is expanding a faculty-led advising model with support from the Booth Ferris Foundation. The foundation has awarded F&M a $220,000 grant to be used over the three-year life of a pilot program that will broaden mentoring for students -- many of whom are the first in their families to attend college -- to ensure high retention rates and help them flourish in college, said Dean of the College Margaret Hazlett. The program begins this 2013-14 academic year, and aims to build on a growing body of research and demonstrated success of peer learning communities and mentoring programs. "Many talented, high-achieving students applying to college today grew up in communities where going to college wasn't always an expectation, and it may be an experience that no one else in their families has shared," Hazlett said. "For these students, who may not know how to take advantage of the resources available, a program of faculty mentoring and a model based on peer support from classmates provide the early intensive support that helps them acclimate to and succeed in college." A Franklin & Marshall College three-year pilot program will broaden mentoring for students -- many of whom are the first in their families to attend college -- to ensure high retention rates and help them flourish in college, beginning in the 2013-14 academic year. Selected students will be invited on a voluntary basis to join one of three mentoring cohorts, Hazlet explained. They'll participate in a faculty and peer model designed to give the students a safe space to freely share concerns and resources to support each other in maximizing their academic and social integration into college. 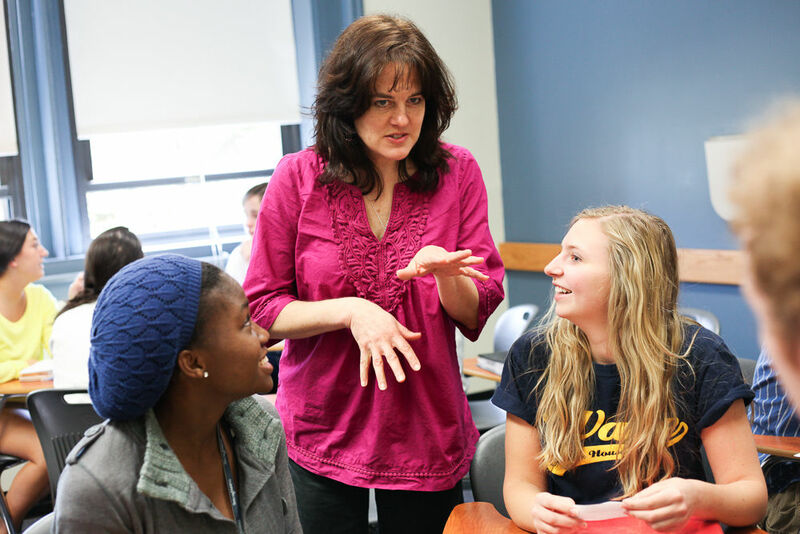 Throughout the program's first two years, weekly sessions with a faculty mentor, two upperclass peer mentors and a program director will introduce the students to topics including academic planning, research assistance at the library, counseling services, leadership development, career mapping and taking advantage of professors' office hours and departmental tutoring. F&M plans to assemble the three new cohorts of approximately 10 students in each of the first two years, for a total of about 60 students in the program. The cohorts will be made up of students from a range of predominantly public schools, including students from rural Pennsylvania, the Southern California College Access Network, and various public charter networks like KIPP and Achievement First. The program will be funded by the Booth Ferris Foundation grant through April 2016. The College won the competitive grant through a proposal arising from a collaboration between the Provost's office and Dean of the College's office, with the support of F&M's Grants Council and the Office of the President. College leaders believe the program will build on the documented success of mentoring programs at the national Posse Foundation, which identifies high-achieving students in underrepresented groups and sends them to partner colleges across the country, including F&M, Porterfield said. After educating Posse students for seven years, F&M in 2012 became the third institution in the country, and the first liberal arts college, to offer a STEM Posse for students in the science, technology, engineering and math fields. Interim Provost and Dean of Faculty Joseph Karlesky said the pilot program will test the efficacy of a F&M’s faculty-led advising model that focuses on retention and academic success for first-generation and underrepresented students. In the past two years, first-generation students have constituted about 15 percent of F&M's incoming classes. "This program reflects our faculty's strength, not only in educating well, but also in demonstrating the power of higher education to respond to the promise of students from every segment of the American economy and from every community across the country," Karlesky said. "We are focusing on the transition to college to ensure that strong students get the strongest possible start." An important element of the pilot program is that it provides support to help equip the faculty mentors who will play a key role in the success of the students, Karlesky said. The upperclass mentors will help faculty plan and facilitate weekly group meetings, the Dean of the College's Office will provide administrative support, and F&M Senior Associate Dean for Planning and Analysis of Student Outcomes Donnell Butler will provide ongoing assessment of the program's effectiveness. F&M's proposal to the Booth Ferris Foundation framed the program as part of an expansion of ongoing efforts to promote college access and success. These efforts have included doubling financial aid since 2008; enhanced admission outreach; creation of partnerships with leading college access programs and school networks in underserved communities nationwide; launching a pre-college immersion program called F&M College Prep; and hosting an annual "College Summit" for high-achieving students from rural Pennsylvania high schools. The College also evolved its career services model in 2012, launching a new Office of Student and Post-Graduate Development. Established in 1957 under the wills of Willis H. Booth, a New York City banker, and his wife, Chancie Ferris Booth, the Booth Ferris Foundation contributes to organizations pursuing efforts in areas that include progressive higher education programs. Casey Castañeda, vice president and program officer for the foundation, said Booth Ferris looks for projects that create not just access for first-generation students, but develops and sustains their academic and personal success. "Franklin & Marshall's project was, from that perspective, compelling," Castañeda said. "Other colleges provide access to first-generation students, but not all provide the guidance necessary for them to succeed. This seems like a creative way to address that."